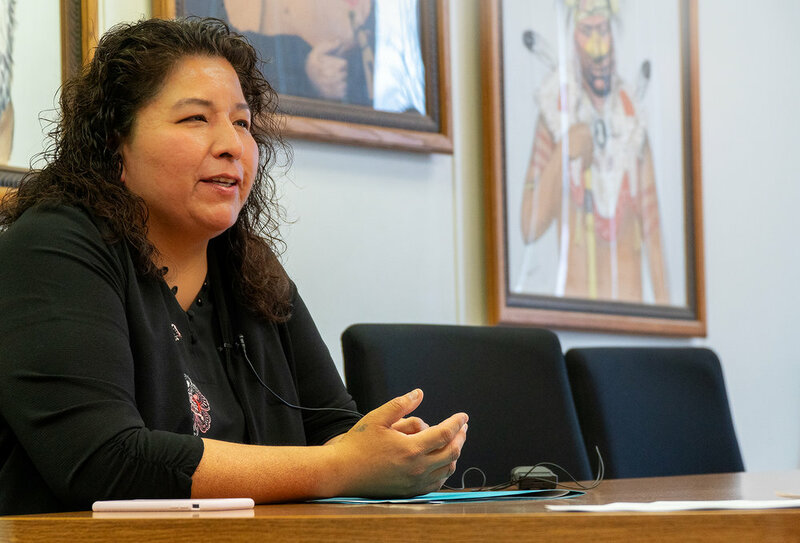 As the IT Director for Meskwaki Nation, Janice has been seminal in making broadband internet access available to every member of the community. She oversees connectivity, data management, and resource management across all the settlement’s departments, and is looking forward to continued growth in the future. She says knowing the range of career options in tech and exploring paths outside of traditional programming was key to finding the right fit. Can you tell us about the Meskwaki Nation? The tribe is about 1,400-plus members. Size-wise I believe it’s over 8,000 acres. They own a lot within this area, but also some properties outside of here. The settlement itself is similar to a small city. We have our Tribal Operations building, which is kind of our headquarters. We have the HR Department, which is in a temporary location until we find a bigger building. We have a wellness center, and beside that is our Tribal Court building that houses our Tribal Court and our Child Support Services Department. Then there’s the museum and the housing authority. And we have our Senior Services Department. They have meals and activities for our Meskwaki seniors. They take them on trips and make sure that they are cared for and assist them with a lot of services. Then we have the school, our Public Works Department, and the Health Clinic. We have an Infrastructure Department, a Housing Department — so many different things. We have a Police Department as well, and we are ramping up for a Tribal Response Emergency Management Team that will be the Fire Department. They are working on so many other things that we haven’t had in the past. I finished my degree at the University of South Dakota. I graduated in 2002, and while I was working on my degree I would come to Iowa to work for the tribe at the casino. It was just seasonal work to get money when I needed it, but it opened the door for other opportunities. The tribe was aware that I was going to graduate with my computer science degree and they encouraged me to come back and apply for jobs. So I did, and luckily I've been here since. Then as I got older, we had computers in school. I think it was fifth grade or earlier when I had a teacher who had about 20 computers in her room. She taught us how to do programming and it was easy and I thought, “OK, maybe I’ll go that direction.” I’ve liked computers ever since. It’s kind of where my passion started, and it seemed pretty natural and pretty intuitive to me, really. Tell us about your role as IT Director for the Meskwaki Nation. What are you responsible for? My role is anything computer or network related. Anything that is digital or has some type of connectivity. That includes workstations, servers, devices, phones and ongoing maintenance of our assets. We do a lot of purchasing, making sure everyone has the hardware and software they need to meet their needs. You were instrumental in bringing broadband internet to the Meskwaki Settlement, and the tribe was selected as Connect Iowa’s newest Broadband Hero awardee for access. What was the process to bring this effort to life? It was a pretty lengthy one. We started our initiative back in 2006. We had strategic planning that year, and that was when the IT Department really became a department. I was at the table with all these tribal leaders and directors talking about the goals of the tribe, and the topic of being an internet service provider came up. That’s what started it. Not only was I developing the IT department, but I was also trying to find funding and support to be an internet service provider. When President Obama took office, he spearheaded the National Telecommunications and Information Administration and BTOP [the Broadband Technology Opportunities Program], which was part of our funding. The executive director at that time said, ”This funding is available, let’s be a part of this.” We did our research and said, “How are we going to get this done?” A friend of mine who worked in the Finance Department was talking to someone at the State Department about broadband mapping, and that sparked the conversation of partnering with the state of Iowa on a broadband project. It just kind of all rolled after that. We talked to a few people at the Iowa Communication Network (ICN) and had five or six meetings about the directions we could go in. By the time we applied with that program, they were already in round two of funding because they didn’t receive enough applicants in round one. So we decided to partner with ICN as a subgrantee and try to get our community served, and luckily we did. The project was awarded. The process was educational, but also very empowering, because it helped us strengthen our teamwork. We had meetings and were continuously updating each other on our progress and making sure everyone was a part of the project. I look back and think, I love that teamwork because it worked out really great and we did a lot of great things during that time. I really enjoyed it. In 2010 we were awarded the funding, and construction started in 2012. But we only served about 53 percent of the settlement at that time. To serve the rest of the settlement, we could either do wireless or we could do fiber. The council said they wanted to make sure everyone was equal, that there would be equal service across the board, so we did fiber. They funded the rest of the project so we’d be 100 percent covered, which was awesome. How has having broadband access improved the tribe members’ quality of life in terms of education, business, and day-to-day activities? Things have really grown. There’s been a lot of progression over time. From an IT perspective, when we first started we had a data center that could only furnish about 2 terabytes of storage. By 2015 we needed something bigger. We needed redundant data centers to help serve different departments and their case management programs. We eventually ramped up our data centers and made sure there was some redundancy in case something happened so we would have a fall-over option. We built those centers in 2015 to make sure we were ready for even more things to come. We’ve kept that going, and now we need even more storage. We try to make sure we meet the needs of all our departments so they are better able to serve all tribal members — so the Police Department can keep track of their crime data, so the Tribal Court can see those cases and share information and notes with one another. Those are the things you don’t really think about as you’re doing it. But you step back and think about how we are instrumental in their ability to serve their clients. What’s on the horizon for the Meskwaki Nation? Any exciting tech initiatives in the works? Everyone always has different ideas and different ways to go. Right now the tribe is working towards a recreation center and has applied for a few grants. That’s going to be the next addition to the area — and trying to get a Fire Department or emergency services here. Right now, they contract with Tama County to answer emergency calls if there is a need for fire or ambulance services. But it would be great to have services on site and to not have to wait 20 minutes for a response. There are a ton of tech elements involved in bringing those services to the settlement, though. It’s a lot of prep and planning and making sure that we have everything available for them. Pulling from experience, these are very needed services. What are you passionate about outside of your tech role? Outside of tech I’m passionate about my family. It’s always family. I’m a single parent, so everything is around my kids, making sure they have what they need. They are involved in sports and are doing great in school. I have three kids and one granddaughter. What advice would you give a young person considering a tech career path or aspiring to a tech leadership role? Know your options and really seek out all the fields in technology. I know that when I was in school I didn’t know all the options that were out there. Most of the colleges get you geared up for programming. That’s great, programming is awesome — but if you’re not going to go after a programming job, then what are your other options? So at least get to know what those careers are and what it takes to get there. What kind of impact do you want to leave on your tribe and the women there who follow you? I would like them to know that women are strong and we are capable of anything, and that’s probably the biggest message for any woman or girl who wants to make an impact. Finding that purpose of your life is crucial for anyone, whether it’s this tribe or any other tribe. Know what your purpose is and be willing to commit your time to that purpose. Technology is awesome, technology is great. It's not hard to figure out. A lot of people think it’s really hard, but it’s really intuitive. It’s just a basic understanding and building some logic to it.